Thoughts of home can be remembered by certain smells too. The smell of jasmine reminds me of summer and my childhood home. We had jasmine growing up the railings of the stairs to our verandah, with each step we took to get to the front door the scent got stronger. The smell of the ocean reminds me of my home growing up too. We live across the road from the lake and on those hot days the weed that has drifted onto the shore gets a bit sunburned and smells quite distinct. As I drive over a bridge that connects two suburbs within our home town I pretend that I’ve never been across it before. The bridge crosses the beautiful Lake Illawarra and I ask myself ‘would this place make a special home for a family?’ It’s not a hard question to answer as the boats, the crystal clear water, the island, the water sports, the picnickers and the picture the area evokes answers it for you. As I continue to drive along the road just past the bridge I see my home. Today our home looks different than yesterday. For today we have an empty car spot out the front. I had to make a heartbreaking decision today to surrender Jacob’s car. I felt really guilty getting rid of it to the scrapers. It runs out of registration tomorrow and it was in need of some major repairs and to fix it and register it again required money we just don’t have at this time of year. It was only ever used as an emergency car if ours were getting serviced. It had done us proud for the period we had it in our possession. Jacob bought it with his own money and it got him from ‘a’ to ‘b’ without much going wrong with it. Watching it drive off on the back of the truck brought the tears strong and fierce. A little white butterfly circled the car for one last inspection and it was gone. I hope Jacob’s enjoying his ride in Heaven now it’s gone home to where he is. I wish you could bottle up those scents that take you home within your memories. His car smelt so familiar still to this day, and by no means an unpleasant smell either. I’ve come to realise that the definition of home does not always mean the place where you live. Home is a person or place that makes you feel completely safe and comfortable. Home – a story of who we are and a collection of things we love. Here’s a photo of ‘home.’ This is the sight we see as we drive along the familiar road and spot our house with lots of cars out front – minus one. 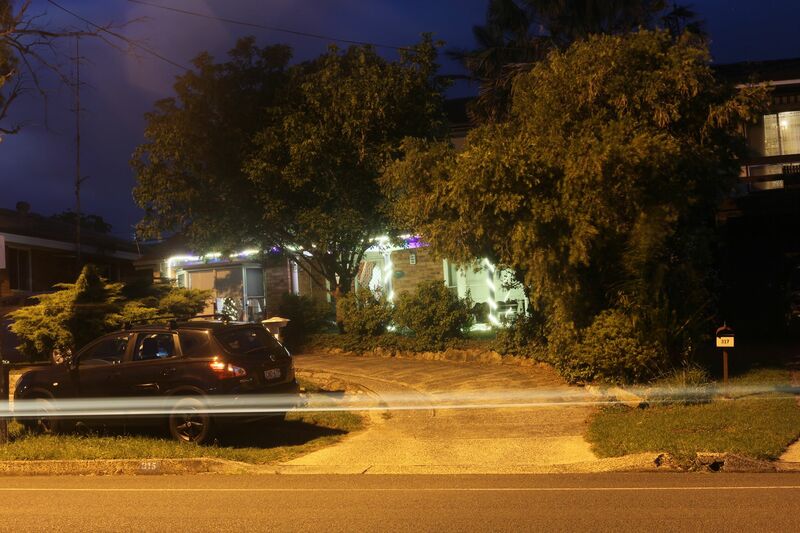 I captured the headlights of another car passing my home looking like a streak of lightning as I took this shot aglow with Christmas lights as well. I’m Debbie, a 53 year old married mum of four young adults – 3 beautiful beings on earth and 1 equally beautiful Heavenly son. As a little girl I dreamed of becoming a nurse and a mum. I believed I could and I did. A newly graduated nurse married her soulmate in 1987 and with this union came 4 children within the next 7 years. Life was good….fast forward to Oct 2015, to where we lost our 20 year old son, brother, grandson, nephew, cousin and friend Jacob. In his brave short battle with Ewing’s Sarcoma he taught us to be thankful for every day you’ve been blessed with. I saw his first and last breath in life (although it’s not meant to be that way) and I’m privileged to have been his mum. We are all still trying to adjust to living our lives without him and in ways to make him proud. We spent the last month of his life ‘inhaling’ and breathing him in, wrapping him up in love and making more memories to cherish. ‘Stay golden pony boy’ – a line from the movie The secret life of Walter Mitty. 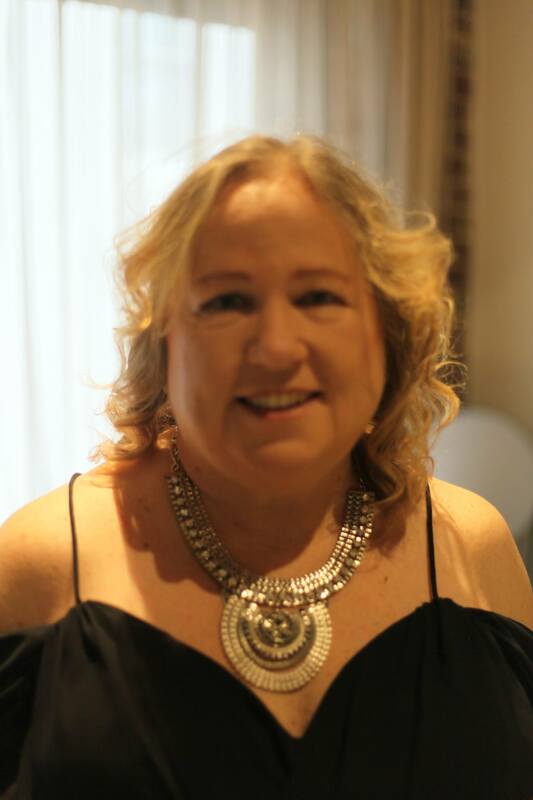 I am…a bereaved mum, a wife, a friend, a daughter, a sister, a niece, an Aunty. I am sad, happy, broken, blessed, shattered, thankful, gutted, mindful and confused all blending into one on any particular day. I am no longer who I was before. But I am learning to smile again – see miracles in life everyday with Jacob’s love and guidance from afar. Never fear shadows. They simply mean that there’s a light shining nearby. I’ve never been scared of shadows. I have loved watching scary movies ever since I was really young. I’d wake my younger brother up in the middle of the night to watch the double creature feature on tv. We’d sit there with our hands over our eyes opening our fingers with just enough room to watch a small section of the screen at a scary part. I must have shared the love of horror films to my children as they have inherited the excited buzz when scared from a horror film. I loved listening to ghost stories by torch light at a campsite. I loved playing hide and seek and finding the best dark place to hide and jump out with a scream when found. Now I’m older and wiser I still never fear the shadows. As I dabble with Jacob’s camera those shadows cast a better picture on what you’re capturing as we learn that the best time to take those perfect shots is early morning and late afternoon where the light is at it’s best. When I look at those photos of people surrounded by a glowing light of birthday candles, or by the twinkling lights of a Christmas tree, a sense of calmness comes over me. There’s something magical about the light from a single match amongst a room full of darkness and shadows. One tiny match can give off so much beautiful light. I have to think that the shadows out the corner of my eye as little glimpses of Jacob’s spirit around me to keep us safe or was it my mind playing tricks? I’d like to think that it was Jacob. I’m lucky that I have Jacob’s movies on his YouTube channels to watch his creative talent come to life as he made his short, scary and shadowy movies that give you that shiver down your spine and make the hairs on your neck stand on end. People who watch one little movie in particular called – Abandoned a teaser trailer, thought it was a real trailer for a new movie that was coming out, and expressed interest and said they couldn’t wait for it to be released. I’m sure he would have become famous had he had more time on earth to pursue his career of being a well known cinemaphotographer. That’s the way I feel about the loss of Jacob. Still connected in so many ways. In shadows, in light, in sunshine, in rain, in life, in death and in my dreams. You can’t outrun your shadow. So, dance with it. Since the passing of my son Jacob I have connected with lots of other bereaved parents on Facebook and Instagram. It was on Facebook when I was on looking at the group ‘facets of grief’ that I first found Beryl Ayn Young’s course called ‘illuminate’ – lighting the path to photographic healing. I loved searching for that perfect photo that captured each lesson and I particularly liked the writing that accompanied that photo as I was writing from the heart. In two years I have created so much in honour of Jacob. 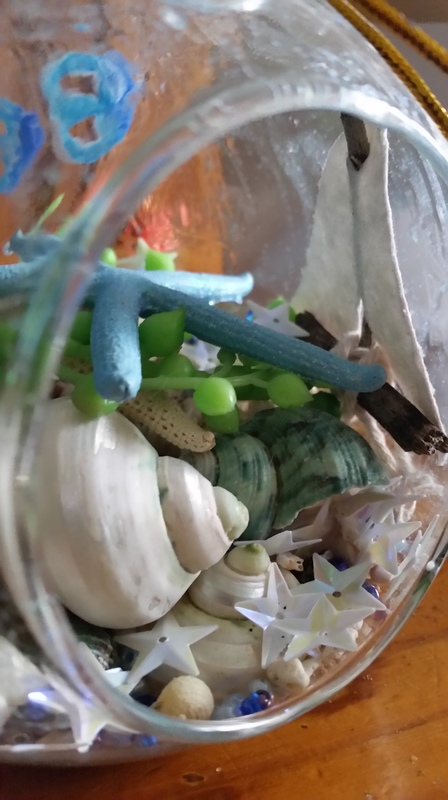 ‘Facets of grief’ gave me 40 different prompts for creativity over 40 weeks (40 weeks was a number chosen to represent the weeks a child develops in a pregnancy) I started my blog as one of these prompts. From connecting with these great sites I have gained even more creative outlets -CaryMarie an artist that paints your child’s name in the sand and runs challenges and memorial days for people to join like ‘capture your grief’ and ‘ the prayer flag’ project, Lexi Behrndt with her beautiful words offering healing from the loss of her son. I’m forever grateful that I found this wonderful site 52 moments:a Recapture Self Photo Community (now Recapture Self Village) with Jen and all the lovely people I’ve got to know online. I look forward to seeing what the weekly photographic word prompt is each week. Once I know the word for that week my brain kicks into gear and I begin to think of different images I get from that one word and how I can relate it to our memories of Jacob as the photos and words each week get placed into my blog – a blog that I dedicate every word to Jacob so his spirit and memory stays alive. There are so many creative outlets that you can tap into and there are so many more that I haven’t even touched on or shared. Well this year I found another one to participate in. 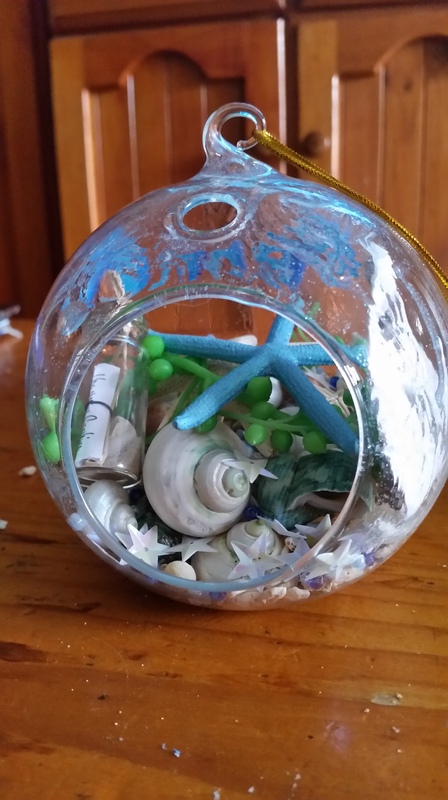 I participated in a memorial ornament exchange for Christmas. Families from around the world complete and return a questionnaire about their child. 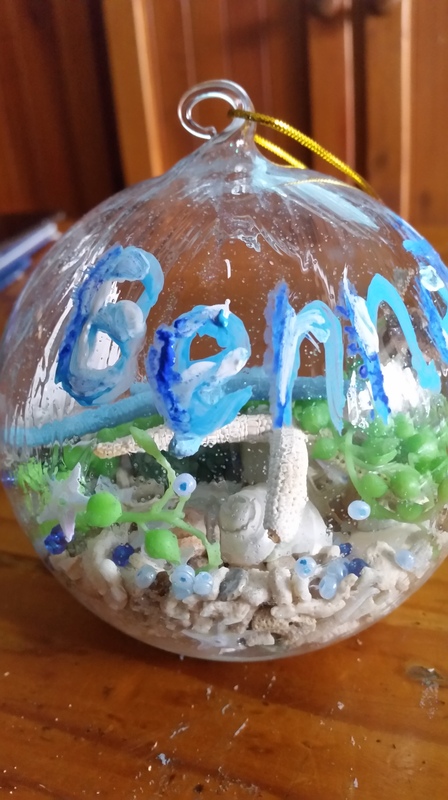 They ‘draw names’ and each family gives and receives a personalised ornament. 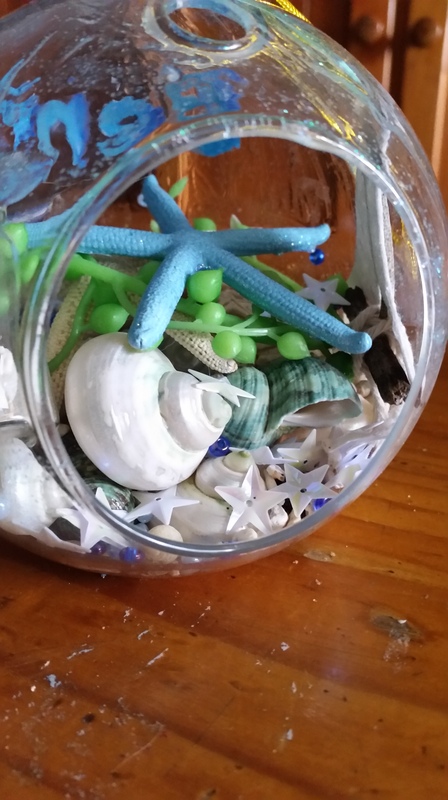 Some families hand make and mail their ornaments, and others order and ship online. I was given a beautiful family to create a memorial ornament for who had lost a baby at birth. 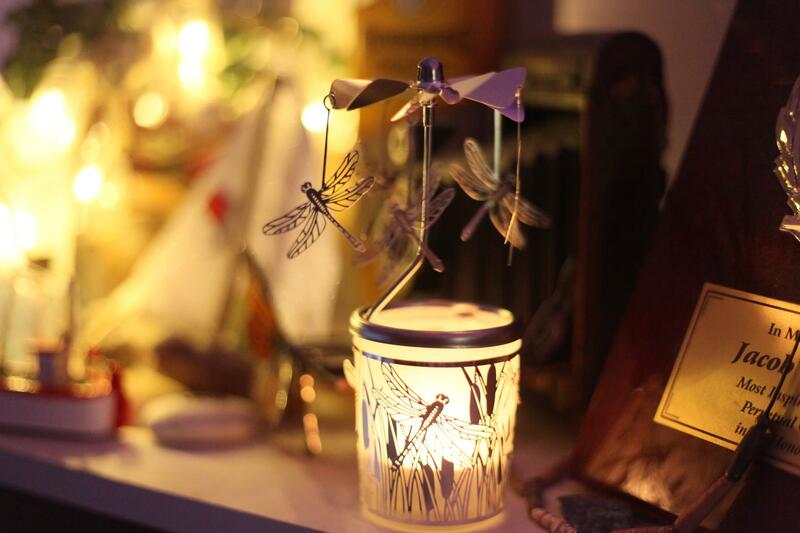 The questionnaire gave me 4 little things that are special to his memory – stars, dragonflies and paper boats and the colour blue. 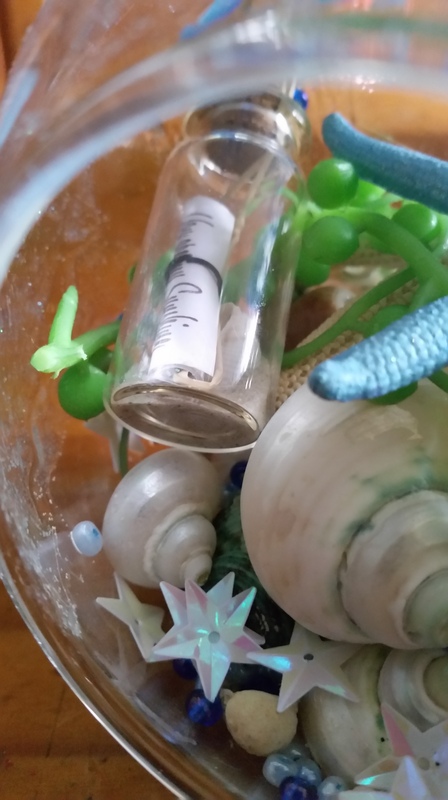 I’m sure Jacob was helping me with this creative task as I began to gather my items. I had a picture in my head of what I thought it would look like and I wasn’t disappointed with the end product. 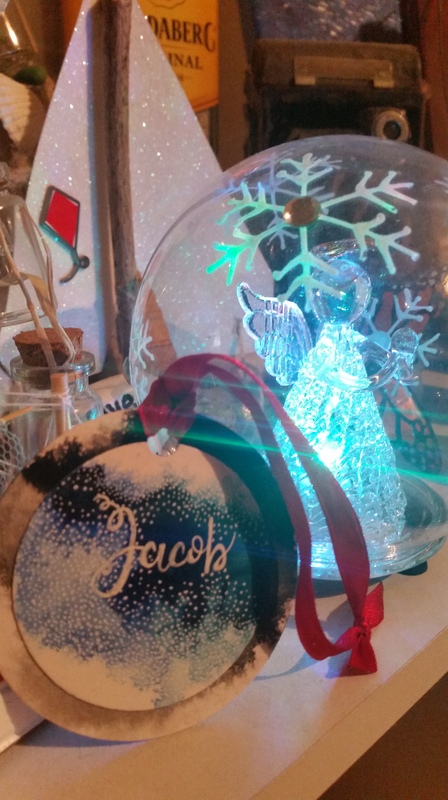 I’d like to think that Jacob has met the little baby that I was making the decoration for, that they’d both be smiling down as their mums create something so meaningful during the festive season. I was absolutely in awe of my memorial ornaments that I received as well. I was asked ‘what was one of Jacob’s favourite movies?’ as his career path was becoming a cinemaphotographer. He had too many favourites but there was one that he commented about on his Instagram account. 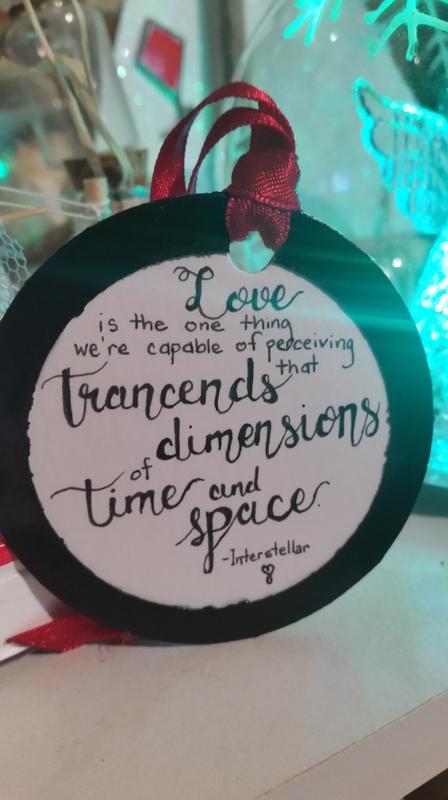 This quote from the movie ‘Interstellar’ was written on the other side of his ornament – ‘love is the one thing we’re capable of perceiving that transcends dimensions of time and space’ speaks volumes. The definition of routine that fits best with my weekday lifestyle is – regular, unvarying, habitual, unimaginative, or rote procedure. It may change slightly on the weekend when life becomes that bit more relaxed. I open my eyes in appreciation that a new day has been given to me and then reach for my mobile phone, then iPad as we do in our digital world. I check my emails, check Facebook, check Instagram, check WordPress, check my bank account and play a silly time wasting game all before I get out of bed. I may skip a few of those items on the last list on a day at work, time is more precious to play the game. I don’t really use my devices until I’m home at the end of the day, as I relax before bed. I’m glad my iPad is part of my routine. This very iPad that I’m tapping my fingers on has been with me through thick and thin. I bought it on the 15th June 2013. It has travelled with me on holidays, involving trips overseas, on long car rides and was my constant companion when waiting and watching Jacob have treatment, tests and surgery. I have my favourite games that I play on my iPad. It has been the sounding block for all my blogs to have been created. So many entries in the ‘notes’ section. I never want to accidentally delete them as the words mean so much. Notes from Jacob writing a script for his next little movie to create, notes from the hospital on the day we found out that he cancer, the notes we wrote together about all the questions we needed to ask the doctor next time we saw her, notes that contained lists of what things to bring in to the hospital like his favourite foods, drink and what DVDs to bring in for him to watch, notes of appointments, tests and blood tests, notes containing important contact numbers for his nurses, notes that pointed out his bucket list of things to complete in the time he had left on earth. I’m dreading the day that my iPad will no longer work as nothing lasts forever. I have had it repaired once when the screen flashed in green lines. It was like losing parts of Jacob all over again, bit by bit. The things that hold memories of the time we had together. Thankfully magic was restored and I get to tap my pointer finger over the screen once again. The protective cover looks old and tatty and could tell a few stories from it’s time. I have now since the first repair backed up my notes, favourite games and all important documents in iCloud. Favourite games like jewels, solitaire, Frozen free fall, wizard of oz and cookie jam blast. I used to be a candy crush player but got stuck on a level and have since lost interest. I think to my myself that my little routine of playing these games keep my brain active and thinking in case I get dementia later in life. Well that was my excuse. When I am playing these silly time waster games my mind does relax and the thoughts that were running a race have slowed to a tortoise pace. I am getting more acceptable to the fact that my old faithful iPad is nearing the end of it’s existence so I have another one on the go just in case. 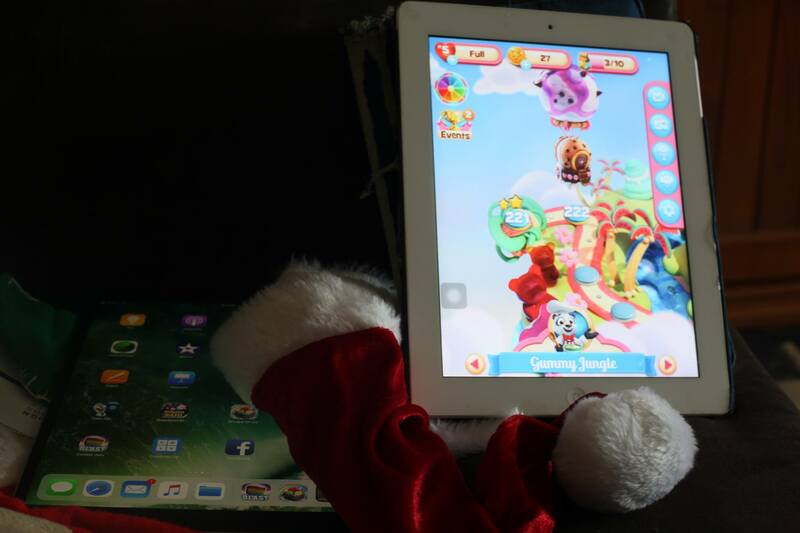 You can see both of the iPads side by side on the lounge amongst some Christmas hats and bills to pay. Jacob had his mobile phone and iPad too to help him stay focused with his mundane routine of when he was in hospital having chemo or enduring a 6 day stint in isolation due to neutropenia where he took time lapse photos from his windows to pass the time. I have kept these too yet we can only use his iPad as his phone has since broken. He played ‘don’t touch the spikes’ another game where he’d have to insert arrows within spaces of a spinning circle, four letters and he’d verse others online in a trivial pursuit type game answering questions about all things movies. Oh how I wish I could see his long fingers of his beautiful hands work the magic of his computer, camera and phone again. Sometimes a break from our routine is the very thing we need. I am going to try and modify my morning routine and slow down on the tapping into technology. When my mobile phone was being repaired I was without it for 3weeks. At first I thought as though I’d lost an arm or leg and couldn’t do without it. But after a while that feeling of wanting it to be with me 24/7 dissipated and before long I was writing my blogs the original way using a pen on white writing paper in an old school book from my children. I can do that again. I am a great believer in variations on routine. I tried so hard to capture ‘family’ during the week to no avail. Our lives are busy at present. I’m working 4 days a week, my husband works too, my eldest daughter Amy has been busy with job interviews and renewing her first aid as well as doing after school care, my second daughter Rachel has already moved out of home and is working as a chef at one of our local wineries and Ben is teaching PE at one of our local Catholic High Schools – hence the hard job finding a ‘family’ moment to photograph. For my birthday in June this year my husband surprised me with tickets to see Cat Stevens early December. On Thursday night my husband Pete asked me to get the tickets ready to take with us for the concert. Much to his surprise I replied ‘I don’t have the tickets, I gave them to you to look after (as this was what we did as he keeps things in order where I lose things). He replied ‘I can’t remember keeping the tickets and they’re not where I would keep them.’ This started a frantic search to no avail they never appeared. Thankfully we were issued another set of tickets via email and the others (if found) would be useless. This concert was last night. My husband and I set off on the journey from home at 10.30am and arrived at our destination at around 2pm, we hit lots of weekend traffic in Sydney so it made it longer. After having at least 3 weeks of glorious sunshine as we drove up the sky looked ominous. 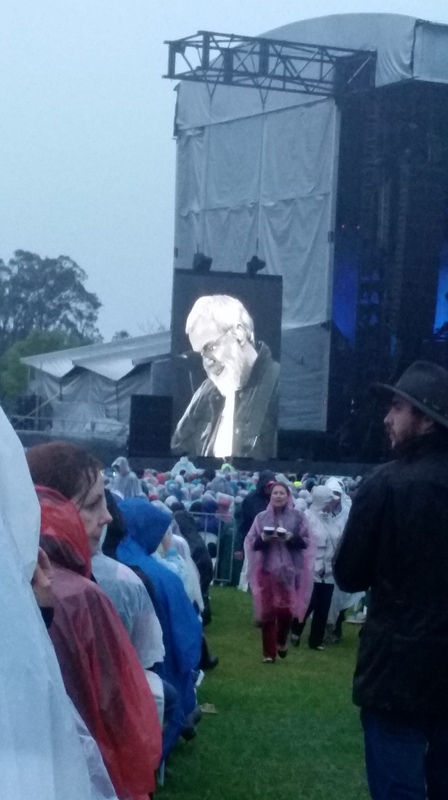 Normally we wouldn’t worry about the weather but the Cat Stevens concert was outdoors in one of the Hunter Valley wineries – ‘a day on the greens’ at night. Needless to say the Heavens opened and we were soaked. It didn’t matter in the slightest as we were decked out with a dark rain coat and bright yellow poncho – very bumble bee looking the two of us together. 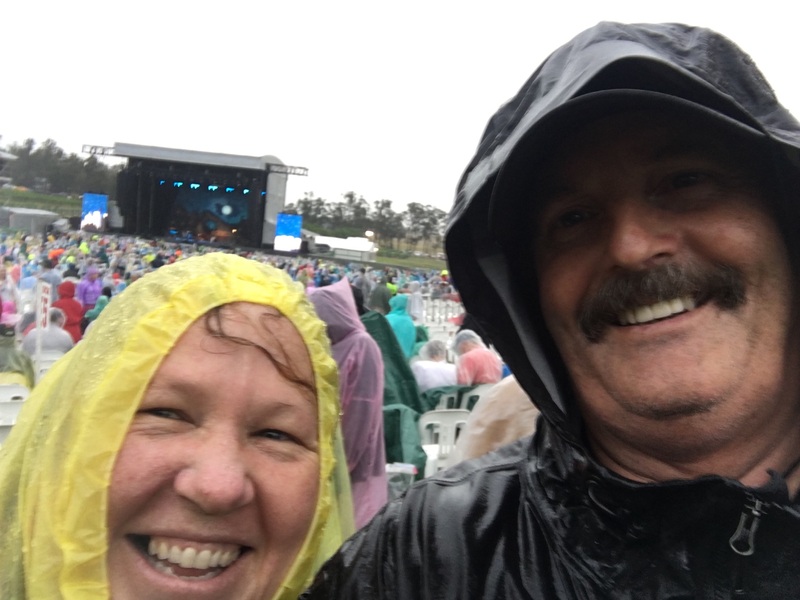 The rain seemed to make the crowd crazier and happier to be out in the elements, bare feet in muddy puddles, rain watering down wine and beer in plastic cups and wearing rain protective apparel that clearly wasn’t working as we blinked to see a few steps in front of us. Smiles all around. It was raining ‘Cats’ & no dogs (just my warped sense of humour 😀). He opened the concert with ‘Wild world.’ Well the weather was wet and wild but we didn’t care. When I think of rain immediately hear the conversation between the characters Allen Parrish and Sarah Whittle in Jumanji when Sarah says ‘well a little bit of rain never hurt anyone’ and Allen quickly replies ‘yeah right’ and prepares for a monsoon in June. Not quite a monsoon but it was more of an inconvenience that you couldn’t get your cameras out for fear of getting them wet and your glasses fogged up with the hot summer humidity so you couldn’t see through them. The rain had paused for one of my favourites. I got my mobile phone out to video the song in its entirety, I thought I’d pressed record but realised I hadn’t so only got a few short bars of the song ‘father and son.’ My husband luckily recorded it. I’m sure that song had even more meaning now that Jacob is gone. He’s never going to have those conversations like that anymore with his son but he will with Jacob’s brother Ben. The song that followed was ‘here comes the sun.’ Another important one as this was the song that played just after he’d taken his last breath and the sun was shining on his face the rest of the afternoon. Our wedding song was ‘morning has broken.’ A fitting song for anyone working in early childhood education was ‘where do the children play’ and a song for the years of our youth ‘remember the days in old school yard.’ Cat belted out one particular number that touched the heartstrings as the concert drew to a close – oh very young, what will you leave us this time, you’re only dancing on this earth for a short while…..will you carry the words of love with you, will you ride the great white bird into Heaven and though you want to last forever…you know they never will, you know they never will, and the good-bye makes the journey harder still. ❤️ The rain blended with my tears and no one could tell I was crying as I heard some of his favourite hits. This is my ‘family’ photo for this weeks prompt along with a quote I found on the Internet – Family is like music, some high notes, some low notes, but always a beautiful song 🎼 …….thanks for the music and songs tonight Cat Stevens. The first sound a foetus and infant hears is their mother’s heartbeat while in utero. As the wiring of the brain makes connections for the ears to hear a song is created. It is a unique song and beat that harmonises the love between mother and her child. This sound is imprinted in the child’s mind. This particular song can be felt and heard again once the child is born. The mother holds them close to the left side of her body near to the heart and rocks them to the unique beat written specially for the two of them. This first sound of a mother’s heartbeat teaches that child to appreciate music. Babies move to music before they have the words to sing, they move their bodies to the beat, clap hands and shake toys and rattles ignited by the first song they hear. As we grow up and begin to feel the music within us we are individually drawn to certain styles of music that make us feel more alive. As I entered my 2nd year as a bereaved mother I made a conscious promise to myself that it was going to be a year of trying new things that I’ve never done before. I kept my promise to myself and in March of this year I enrolled in a local African drumming group. 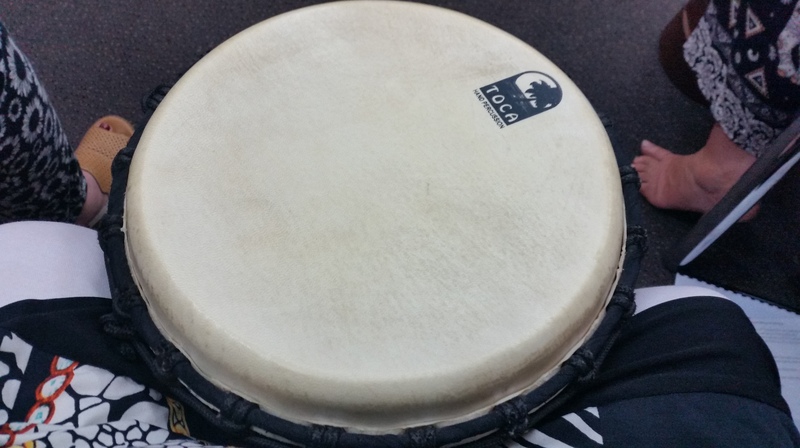 I placed my hand on the large djembe and drummed a beat for my son Jacob. The sound I made with my hand on the drum was a heartbeat. A heartbeat that Jacob had once heard. This was what connected us. It was our song – between mother and son. I played the drum loud and proud in the hope he could hear it and feel it through the vibrations of time and space. Animals too have their own unique beat too passed down to them as a way of connecting and communication. Gorilla’s beat their chest and kangaroos stamp their feet on the ground. Jacob’s own heartbeat stopped just as a special song had finished playing on the iPod. It was a song that he had introduced me to on the way home from having chemo one day. He said to me ‘mum you’ll like this song.’ I did like the song as I heard it with tears running down my face hidden behind dark sunglasses and I liked the title -‘it’s nice to be alive.’ I talk to him all the time in my mind and out loud and will always long to hear his voice in response. We have to find a different way to communicate and connect now he’s not in the physical world. 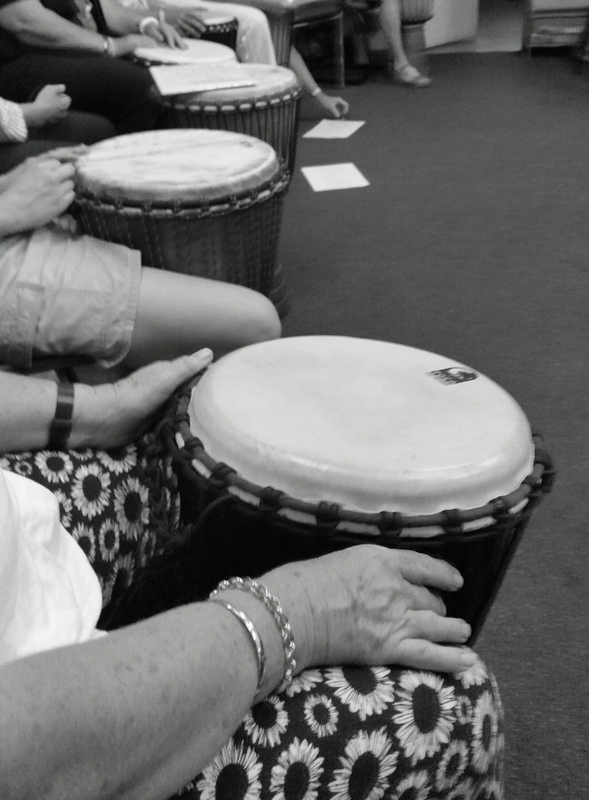 Over the years trauma specialists have recognised that rhythmical music can be beneficial as a way to heal trauma and grief, particularly the studies they have carried out with children. The rhythmical patterns that are played impact the centre of the brain which helps the way humans process trauma. 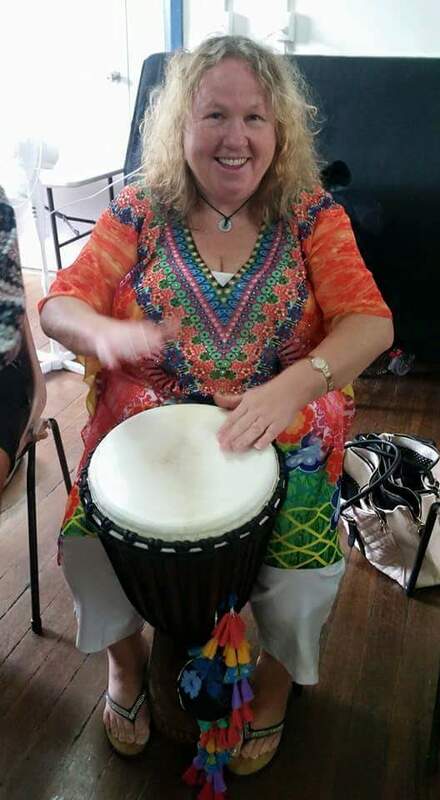 Just this weekend I enrolled in a drum circle facilitators course and met some fantastic people who work with diverse groups within the community like youth, special needs, refugee families and elderly with Alzheimer’s who use rhythmical musical patterns as ways to improve a persons emotional wellbeing (Course was run by Arthur Hull and Ryhthm2Recovery). Maybe that’s the reason why enjoy my drumming each week. I’m allowing my body, heart and soul to heal the hurt of losing Jacob. You don’t even have to be able to read music to play a percussion instrument, you just play to the beat within you, the heartbeat that you played for your child, your song that was written for the two of you. The song that I play will tell you more about me than I ever will. I will find pieces of Jacob in every song I listen to. To all those who have lost loved ones I hope you all find the song that’s written for you. Once you’ve found it, hold on to it and play it loud and proud so our loved ones can hear it. It’s ok to tell your heart to beat again.